Rehne Pedersen aka “Carlos? ?” is from Aalborg, Denmark, and has a birthday of April 18, 1979. Rehne Pedersen only started playing poker in 2002, and before 2005, Rehne Pedersen had only been known around Europe, but that changed when Rehne won his way into the 2005 World Poker Tour Five Diamond World Poker Classic thanks to a $100 buy-in online satellite. Rehne Pedersen had a fierce battle at the final table, being able to knock out the legendary Doyle Brunson in third place to go heads-up against Patrik Antonius. In a big pot on the second to last hand, Rehne survived an all-in when his A-4 beat Antonius’s A-K by making a straight. Antonius was left with only a few chips, which Rehne Pedersen took on the next hand to become the champion and win the $2,078,185 first prize. Rehne Pedersen is still more well-known by his online screenname at the online poker rooms, “Carlos? 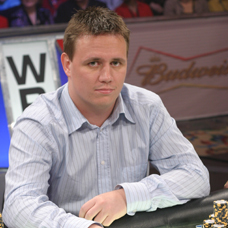 ?”, but more people know him as Rehne Pedersen after he defeated a field of more than 550 players to win a WPT title. Rehne Pedersen favorite poker game is the no limit Hold’em.